I highly recommend to get proper high speed cards for any hacked GH, GF or TZ series. 1. Your local thrusted shop. 3. 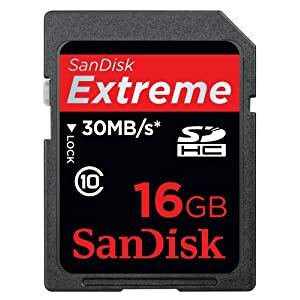 Beware of eBay, as many are selling non-genuine SanDisk cards. Use only thrusted sellers. He sold close to 300 units. I'm gonna try my luck. Amazon is about the same price, isn't it? Fry's typically has sales on Class 10 Patriot LX cards. Just remember to format in camera after you fill the card a few times. We are talking about sellers who sell worldwide. BTW those two pics look different... what's up? Yeap... they do look different. I don't have good vibe about this. Never heard of 30MB/s SDHC "I". After I received it, the ebay seller changed the return policy to 5 days. Luckily I get 30 days full refund policy. I'm gonna return it tomorrow. Hmm... bummer... B&H discontinued Sandisk Extreme III. Is the dealextreme site reliable? @Stonebat, the conventional wisdom is that ebay is the most likely place to get bitten by a Sandisk clone. Authorized dealers are always safer. I have a GH2 and have had good luck with Transcend, Sandisk. I've had one Panansonic Gold stop recording after 15 minutes. Mighta been the cam, but I think it was the card. All my cards are Class 10. Yeap. Learned my lesson. Good thing ebay is friendly to buyers. If the seller doesn't respond, I can resolve through ebay directly. Buying genuine items from ebay... I won't do it again. I did check up on the german amazon page, and find both versions available, the prices are significantly different, and the technical specifications are confusing.... at the "HD video" marked card is specified at 20 MB/s even the printing says 30 MB/s.... yes confusing... too many employees being " overeducated-nonskilled"
Hmmm... this is getting interesting. I got no response from the ebay seller and opened up a case against them through ebay resolution center. If no response from them, ebay will give me a full refund. Since I don't know where to ship it, I might just keep the card until they respond. I have little doubt that the seller has been selling counterfeit goods. What do you think about this card? Reference Tesselator's two SDHD Class 10 Extreme photos above: Called Sandisk tech support and inquired about them and the person I talked to stated that the "HD Video" version's performance is the same as the other. The "HDVideo" card is new and supposed to utilize the latest software. I asked him which card he would use and he stated either one as the performance is the same. Only after I opened up a case against the ebay seller, he accepted the full refund request. It took him 4 days to respond. He might be selling genuine Sandisk cards, but the slow response didn't give me good assurance. At least I'm not giving him any negative feedback since I can't really verify it. Too late. I aleady sent. USPS couldn't reach to the seller. I escalated the issue, and ebay gave me a full refund including shipping cost. Thanks Mr.eBay!!! Small note to readers of this topic. >"I escalated the issue, and ebay gave me a full refund including shipping cost." Do not do it, unless cruicial. Because 98-99% of sellers are good people and something can go wrong or you think that it went wrong. Communicate with seller and calm down. The seller didn't repond to me until I reported the issue to ebay resolution center. I sent the package to the address he told me. That was 2 weeks ago. From DC to NYC. USPS failed to deliver on June 2nd.The seller must have been notified multiple times to pick it up. Never picked up. eBay kept asking me if the issue was resolved. I waited and waited... but gave up. I explained the situation, and it was escalated today, and eBay customer support determined to give me a full refund. If you look on B&H they have a deal where if you buy 2 or more 16GB cards they are significantly cheaper than you get anywhere else. You can also see that there are 2 versions on their site, One I believe is a newer generation with a change in decal to accommodate all of the SDHC camcorders as it displays an hour time like the mini-dv tapes, making it easier for consumers to make buying decisions based on size. It will show if the card is a fake (eg. lower size and just reprogrammed to report the larger size, meaning data gets corrupted as you fill it up), and also the average read/write times. It completely fills the card and then verifies the contents. I just had a fake 'Class 6 32GB' microSD card, that was actually a 1GB Class2 card. Ebay is flooded with these (domestically and overseas). It came with a bad quality SD adapter, the card had to be forced into it, and it still didn't work - and apparently the genuine Sandisks don't even ship with an adapter. Bear in mind that the speeds may be limited by the card reader - I have a fast Sandisk reader that gives me the full speed of my 32GB 30MB/s Extremes, but many card readers crap out around 7MB/s. I'm sure a lot of sellers are fully aware they're selling fakes - but the reprogramming is a nasty trick, many sellers put a few small files on the card and it seems to work, but they don't fill it up enough to discover it's been reprogrammed - and even if they do they just assume that particular card is bad, and sell it as 'faulty' on Ebay.